Haven’t decided on a hotel yet? 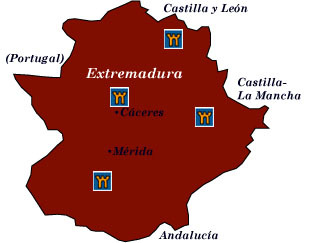 You can look at other available hotels in the Extremadura region with Booking.com. The ruggedly beautiful region in southwest Spain known as Extremadura features bleak mountains and empty plains populated mainly by sheep. Not all is bleak, however, a semi-circle of wooded sierras, hiding verdant valleys filled with olive and cherry trees mark the northern, eastern, and southern areas. The best time to visit is in spring, when brilliant daisies and red poppies bloom across meadows. Roman Spain, known as Lusitania, stretched across the Iberian peninsula with its capital at Mérida, an important town that guarded the Vía de Plata, the Sevilla to Gijón Roman highway. The fall of Rome meant the decline of Extremadura. In the 16th century the surrounding poverty spurred many conquistadors to leave the region in search of riches in the New World. When they returned fabulously wealthy, they built magnificent palaces in cities such as Cáceres and Trujillo and turned the monastery of Guadalupe into one of the great art repositories of Spain. Trujillo Trujillo’s Plaza Mayor is one of the most beautiful of Spain. Tiled mansions, fruit trees, courtyards bursting with plants, convents, churches, and the remains of a Moorish fortress highlight this delightful hilltop town. Trujillo is also the birthplace of the conquistador who decimated the Incas of Peru, Francisco Pizarro. Cáceres A free trade town in the 13th century, merchants and aristocracy built stately homes and palaces to show off the considerable wealth they had amassed. Most of the buildings here date from the Renaissance age. Escaping damage from wars of the 19th and 20th centuries, Cáceres is now a Spanish heritage city, its casco antiguo, or old town, a delight to roam in. Mérida Famed for the wealth of its Roman ruins, Mérida is a lively town, the seat of the Extremadura region. A single ticket provides entry to the Arqueológica de Morería, the Teatro Romano and adjoining Anfiteatro, and the remains of various mansions filled with mosaics and frescoes. The Puente Romano is one of the longest Roman bridges at 792 meters. The Museo Nacional de Arte Romano houses an excellent collection of Roman artifacts. The Alcazaba, an interesting Moorish fort built in AD 835 on Roman and Visigothic ruins, can be visited as well. Extremaduran castles For the castle enthusiast, Extremadura has a couple of areas with a good assortment of castles to explore. The frontier area with Portugal has the best castles: Castillo de la Luna in Albuquerque was built on the site of a Moorish castle and is the centerpiece of an entire system of defensive frontier castles. (A Youth Hostel is installed in part of the castle.) Olivenza dates from the 14th century and houses an ethnographic museum. Zafra castle is a stunning parador. Jerez de los Caballeros, birthplace of Vasco Nuñez de Balboa—the discoverer of the Pacific, boasts a former Knights Templar castle. The northern edge of Extremadura in the Sierra de Gata has a number of Moorish castles, which came under the control of the Knights Templar and the Knights of Alcántara after the area was reconquered in 1212. Look for castles in Elvas, Gata, and Villamiel. Parque Natural Monfragüe More than 75% of Spain’s protected species reside in this preserve, including colonies of raptors and the largest concentration of black vultures in Europe. Guadalupe is home to the shrine of the Virgin of Guadalupe—a pilgrimage site second only to that of Santiago de Compostela. Documents authorizing Columbus’s voyage to the New World were also signed here. Although it’s a good distance from most cities, the drive to Guadalupe is a beautiful one, and the first sight of the Real Monasterio de Santa María de Guadalupe is amazing. The Monasterio de Guadalupe also provides fascinating accommodations.